" J. Napoléon Croisetière & E. Debien Props. " 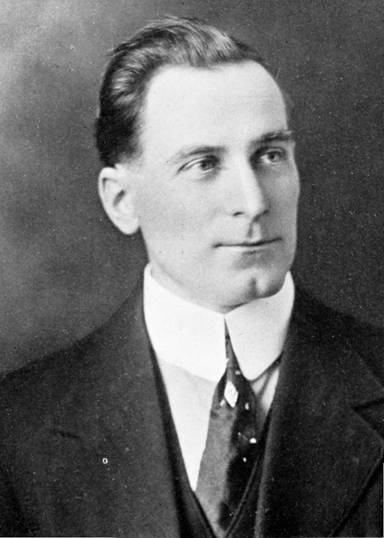 In 1912, J. 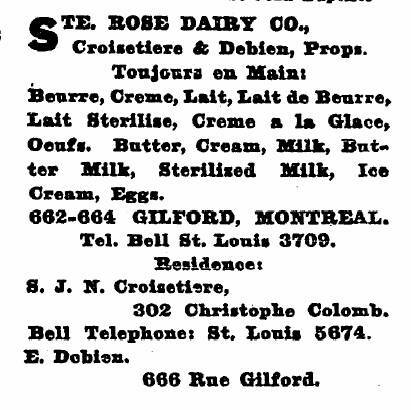 A. Miller sells to Mr. Croisetière and Debien the "Maple (Leaf) Dairy Co." situated 664 Gilford St. in Montreal and they changed the name of the dairy for "St-Rose Dairy Co."
This new name comes from another dairy that Mr. Croisetière owned in the Ste-Rose village, today part of the Laval area. The dairy in Ste-Rose village was situated close to the ancient public market, corner of Sainte-Rose boulevard and Des Patriotes Street. At that time, Mr. Croisetière was living on Christophe-Colomb Street while his partner Mr. Debien, was living at 666 Gilford Street, beside the dairy. Between 1912 and 1915, in Montreal Lovell's, the address of the Ste Rose Dairy changes a bit. Sometime it indicates 664a Gilford St., sometime it indicates 664 or 662 but always on Gilford Street. In 1912-13 the dairy always sells butter, creame, butter milk, sterilised milk, eggs and ice cream. In 1914, it looks like the dairy belongs to Mr. Croisetière alone. 1914 picture of the Ste-Rose Dairy Co., Gilford Street Montreal. Summer of 1916, Ste-Rose dairy moved in new building situated 2716, St-Urbain Street; not far from Van Horne Street and the Canadien Pacifique railroad. The dairy do business there for less then a year because in june 1917, Lovell's shows that the 2716, St-Urbain Street is now occupied by the St Lawrence Machinery Co.